“Creative Scotland announced this month’s open project fund awards today. We are honoured and delighted to have been awarded £32,000 towards creating our next graphic novel. This new fairy tale adaptation will follow on from the success of The Red Shoes and Other Tales and The Little Mermaid. The book will be published by Papercutz as the third volume in the collection, its title to be revealed at a later date. Where to Find Us at TCAF 2017! Papercutz is delighted to be returning to Toronto for TCAF 2017 with our special guests Metaphrog (courtesy of Creative Scotland)! John & Sandra will be at the show both days, signing copies of THE RED SHOES and THE LITTLE MERMAID and meeting and greeting their many North American fans. Come by TABLE 252 (on the 2nd Floor of the Toronto Reference Library) to say hi and see all of the great books we’ll have on sale. For more details and panel locations visit the TCAF official website. Metaphrog Celebrates a Comics Anniversary! 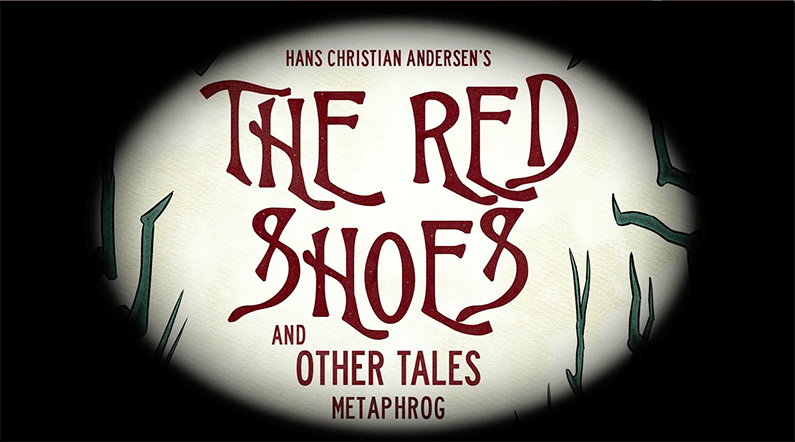 Sandra Marrs and John Chalmers (aka Metaphrog) have been creating graphic novels like THE RED SHOES and THE LITTLE MERMAID for over two decades. They recently penned an overview of their lengthy career on their own blog and they were kind enough to give us permission to reprint that article here. It’s a fascinating look at the development of two truly unique artists. 20 Years Since Our First Comic! Unbelievably, this month sees the 20th anniversary of our very first comic. When we met in 1994 we started working on comics together almost right away and, after creating several short comic stories, eventually collected them in our first comic Strange Weather Lately – Martin Nitram #1 in December 1996. We brought this out with limited edition lino prints in silver and the tagline: “Stories from the surreal yet unnervingly real world of Martin Nitram”. We jumped up and down a bit when Diamond Comic Distributors agreed to distribute it through their Previews catalogue. Thus began our career in comics. At the time we were told our comic was the wrong size (we’d had it printed A4). But we didn’t really care – we hadn’t even thought at the time about comic shops and their coffins or boxes for storing American comic sized titles. Indeed we knew very little about the workings of the comic market. The comic quickly sold out. (There doesn’t even seem to be any copies on ebay now!). We followed this up with The Maze and then with a longer and more intricate Strange Weather Lately story arc published as bimonthly comics and gathered them all in our first graphic novels in 1998 and 1999. At the time, the Scotsman newspaper ran a “Who to Watch” feature on us and we were interview on the radio for The Brian Morton Show. Between 1999 and 2011 we worked on the Louis series of graphic novels. Louis – Red Letter Day was originally intended to be a one off but we realised how much we loved the character and working with the Louis world that five more books followed. Much to our amazement we received nominations for the Eisner Awards and also the Ignatz Awards and international acclaim. We were delighted to receive coverage in mainstream media as many places didn’t really review comics or graphic novels in the early 2000s. Our Louis books, perhaps because they were so different and a bit strange, found their way into publications like i-D (where Kodwo Eshun described Louis – Red Letter Day as “a seriously spaced enigma”), The Guardian (with a column on our work by Julie Burchill), SFX, Art Review, New Internationalist, The Herald, Creative Review among many others. Our comic/music/animation project with hey and mum and the Fat Cat record label, Louis – Dreams Never Die, was featured on the late, great John Peel’s radio show along with his beloved The Fall and even received a lengthy write-up in Liberation in France. In 2002 Louis – The Clown’s Last Words was the first graphic novel ever to receive funding from the Scottish Arts Council. The Scottish Arts Council became Creative Scotland and they have continued to be very supportive of our work. Looking back now it is truly hard to believe that it’s been 20 years already! Since then we’ve devoted all our waking hours to making graphic novels and comics. Naturally, there have been ups and down, disappointments, rejections and moments of elation. When we started we were both determined to make a living from our work, from being a writer and artist, but had absolutely no idea if this was even possible or indeed how we’d go about it. Comics weren’t even respected back then, and many people thought they were just for kids, or just trash. Initially in the UK and US, we kept on being told that our work was too European, while in Europe, and in France particularly (even though Sandra is French) we were told that our comics were too Scottish. This is possibly because we were feeding them potato scones. Now things have changed and more people see comic and graphic novels as art. This year saw us win the Sunday Herald Scottish Culture Awards 2016 for Best Visual Artist. It felt like a real achievement and a great way to celebrate the anniversary of our first publication. And we still don’t take anything for granted. We’re delighted to be creating new work with support from Creative Scotland and are working with Papercutz, who published The Red Shoes and Other Tales in late 2015, and who will be publishing our graphic novel adaptation of The Little Mermaid in April 2017. THE RED SHOES: Educator’s Guide is now available! THE RED SHOES: Educator’s Guide is now available! One of our best reviewed graphic novels of last year was Metaphrog’s wonderful THE RED SHOES AND OTHER TALES. We’ve heard from numerous teachers and other educators who want to use the book in their classrooms. That’s why we’re so happy to announce that we’ve just posted a new educator’s guide to the book on our Resources page. If you’re interested in incorporating the book in to your lesson plan or even assigning it to individual students, this new booklet will be a great resource. Download your copy today! While we’re all still excited by the debut of our first original graphic novel of the year, THE LUNCH WITCH, we’re also looking forward to our next OGN, THE RED SHOES. Metaphrog, the incredibly talented duo behind THE RED SHOES have put together a haunting trailer for this special volume (coming from Papercutz in October of this year). Once you’ve watched the video below, we’re sure you’ll be counting the days until October too!